Rangelands are complex systems to understand and to manage. Luckily there are tools available to aid in making management decisions such as setting initial stocking rates, identifying the current state of the site, and determining past management practices, as well as the potential of a site. The Web Soil Survey and Ecological Site Descriptions are two such tools where land managers, consultants and Extension educators can get site specific information even prior to visiting a particular location. This fact sheet provides detailed instructions for navigating the Web Soil Survey system. Refer to fact sheet NREM-2900 for information about Ecological Site Descriptions. The Web Soil Survey (WSS) is an online web based tool where information that was traditionally available through hardcopy county soil surveys is now available digitally. The benefits of this online version include having the most current information available and the ability to limit the information to what is relevant for specific land use concerns (i.e. rangeland versus cropland). 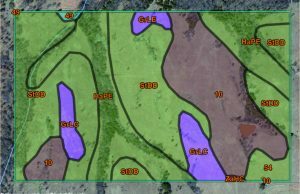 Users can create colored soils maps with either satellite imagery or topographic map backdrops for their selected Area of Interest (AOI). In addition, any description or map created in the right-hand panel can be added to the free shopping cart and either printed or downloaded as a single PDF document. One important resource for rangeland management found on the WSS includes annual forage production estimates for different plant communities that are commonly associated with specific soils and geographic locations. Although clipping and weighing actual plant production is best, initial stocking rates can be calculated using these production estimates. Detailed information about those plant communities is also available with species lists and a model, called a State and Transition Model, of how the plant communities on that site may change under different management practices. Another important type of information available on the Web Soil Survey includes the ecological site description identification number which can be used at the Ecological Site Information System at https://esis.sc.egov.usda.gov/Welcome/pgReportLocation.aspx?type=ESD to access approved Ecological Site Descriptions (ESDs). ESDs are detailed descriptions of the topography, weather, and plants typically found on a site with a particular geographic location and soil type. They provide information concerning the potential plant communities a site could support as well as how particular management practices will maintain or change those plant communities. Refer to the Web Soil Survey Quick Guide below for instructions on how to navigate the Web Soil Survey system. Figure 1. 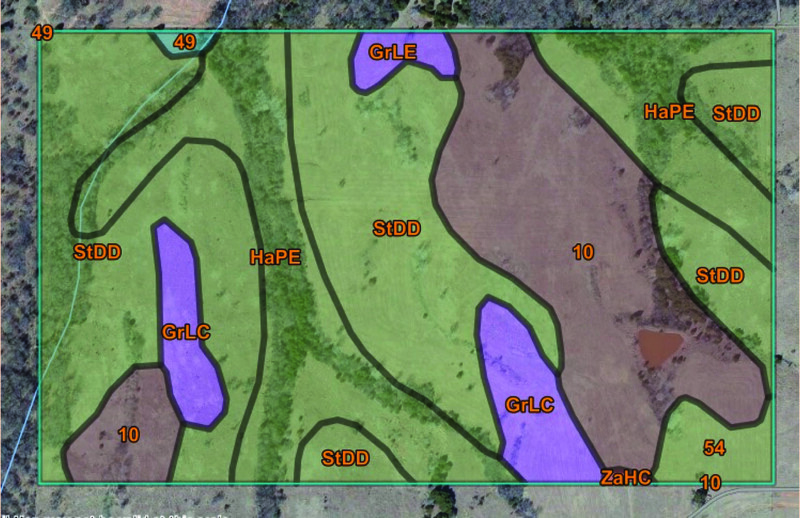 A soils map for a cross timbers pasture in Oklahoma.